This remarkable book covering short poetry forms is clear and easy to read, and is full of classroom-ready exercises that will delight teachers of English Language. It takes the teaching of haiku to a level deeper than the 5, 7, 5 syllable count which is actually not how haiku is usually written in English. The author also explores the writing of haibun (haiku embedded in prose), haiga (haiku accompanied by parallel artwork—photography, painting, sculpture), tanka (5-line poetry form) and renku (group poetry writing). The book is illustrated with many examples of student writing as well as writing by some of the leading lights in North American short-form poetry. The essays by these poets are inspirational and practical, giving lesson ideas and book and web site references. The examples they provide are student-relevant, e.g., in Pamela Miller Ness’s article on art and haiku she suggests a trip to the local art museum to inspire haiku writing. 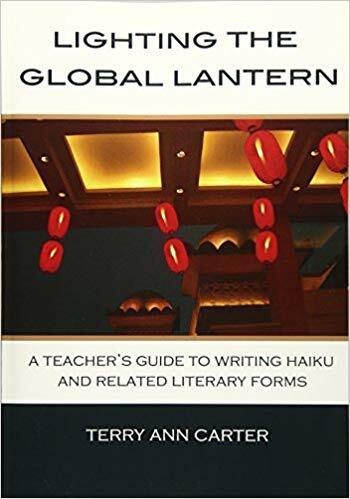 Other brief essays include suggestions for a haiku-slam, how to do a classroom-linked poem, suggestions for ESL and bilingual teachers, how to write speculative haiku (scifaiku) and haiku in comic-book format. This book is crammed with wonderful ideas for poetry and art projects that will interest your students. Highly recommended.